As a leader in alternative powertrains for commercial vehicles, Iveco participated in the recent International Road Transport Unions (IRU) global event for road transport, mobility and logistics. 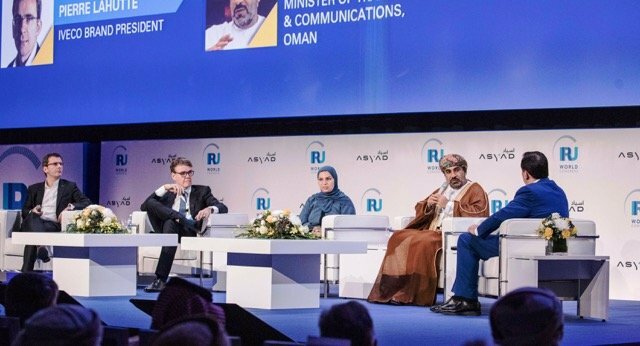 Held in Muscat, Oman, it gathered together business representatives, government officials and thought leaders to debate the big challenges and opportunities facing the transport industry. Pierre Lahutte, IvecoBrand President, addressed delegates on the brand’s perspective on the future of road transport which is undergoing a revolution, and the key role of alternative traction technologies in meeting these challenges. Mr. Lahutte spoke at the first plenary session, which is dedicated to road transport, mobility and trade in the 21st century under the title of: “What does the constantly evolving ‘new world’ order mean for road transport?”. He outlined Iveco’s focus on sustainability to reduce the environmental impact of the industry, highlighting the need to find an alternative to diesel as pressure on this fossil fuel mounts and bans are introduced in a fast-growing number of cities. The IRU Congress also represented an opportunity for engaging in dialogue with transport ministers and high-level institutional representatives from the Middle-East region and beyond, including Europe, and introducing them to Iveco’s vision for sustainable transport. Iveco sees natural gas as a key energy source, especially for goods transport and long-distance haulage, with electric propulsion having a role to play especially at low speed, low energy intensity stop-and-go missions and people transport in city centres. “Natural gas offers the added advantage of a seamless transition to bio-methane, a renewable energy source capable of zero emissions or, with a circular economy approach, even a negative carbon footprint due to carbon sequestration,” stated Pierre. The view of natural gas as the immediate solution for sustainable transport is shared by EU institutions and governments, which are supporting its development with a variety of actions. These include the financial incentives for energy-efficient low CO2trucks, and exemption from motorway tolls for LNG (Liquefied Natural Gas) vehicles announced in Germany; the elimination of excise duty on LNG and taxation of diesel to fund the development of the LNG infrastructure in Poland; and the decrees issued in France and Italy to promote the use of bio-methane produced from cow manure and agricultural waste to fuel transport vehicles. Gas Networks Ireland is working on similar initiatives for the Irish Government to deliver. Othersession’s speakers were leading figures from business and governments, and included José Manuel Durão Barroso, Chairman of Goldman Sachs International and Former President of the European Commission; Christian Labrot, IRU President; Dr Ahmed Muhammed Al Futaisi, Oman Minister of Transport and Communications; and Steffen Bilger, State Secretary, Germany Ministry of Transport and Digital Infrastructure.